Rober's Lemon Rose Scented Geranium is a very large robust plant filled with spicy lemon rose fragrance. 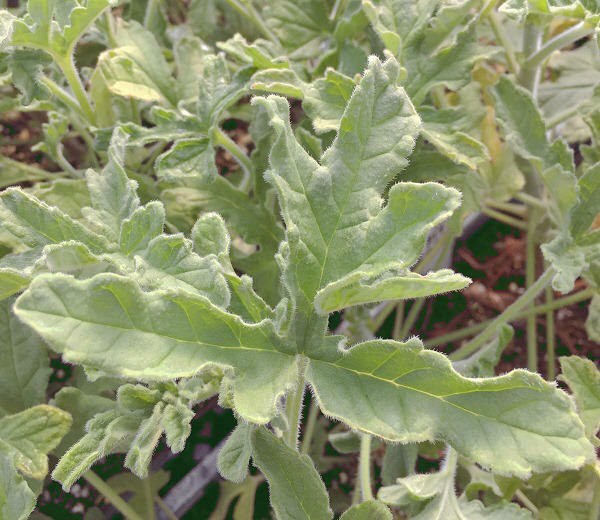 The goosefoot shaped leaf is unique among Scented Geraniums. It is deifniately a sport of another scented geranium which has a more regularly shaped leaf. And it will occasionally push up stems with leaves that look more like a rose geranium. Indeed, some folks think it may be a rose geranium sport but this has not been proven. Just cut off any unusual looking branches and let the beautiful shape and fragrance of Rober's Lemon Rose fill your space. Plant several along a pathway and brush against them often! Rober's Lemon Rose Scented Geranium is one of six plants chosen to be in our Zone 8-11 Fragrant Herb Garden Six Pack.